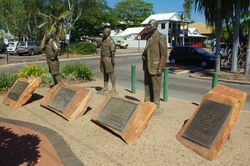 The Cultured Pearl Memorial depicts three key people involved in the Kuri Bay pearl industy, T Kuribayashi, Keith Dureau and H Iwaki. Mr.Tokuichi Kuribayashi was originally from Nippon Pearl Company, Tokyo, while Mr. Hiroshi Iwaki and Keith Francis Dureau were from Pearl Prop. Ltd. The memorial also contains tribute plaques to all those who sailed the sea and dived for pearl, as well as a plaque paying tribute to indigenous pearl divers. The 'golden age' of pearling was during the years before World War 1 when 403 luggers operated out of Broome. The recovery after the war was slow. By the 1930s there were no white pearlfishers and the industry had been effectively taken over by Japanese crews. By 1939 there were only 50 luggers operating in the waters around Broome and the pearl industry was severely depressed. After the Second World War the pearl industry started up again but this time it was with cultured pearls with the process being learnt from Kokichi Mikimoto. By 1956 a cultured pearl consortium had been established and by the 1980s it was earning over $50 million per annum for Broome.